Rainy and flood season has arrived. A situation which is also automatically become the season for increased dengue hemorrhagic fever disease. The disease is difficult to eradicate in the presence of this two seasons. Poor Ecosystem, ignorance, and poverty add more to this problem. A disease said by a health expert at Johns Hopkins as a disease cursed by God or illness from the devil (devil disease) (1). If what is said by T. Mudwal that the basic pathogenesis and pathophysiology of primary dengue infection is hipersensitivity is true, then the countries of Southeast Asia and beyond, can indeed be cursed by God. Curse because it is often exposed for a lifetime with all kinds of manifestations of dengue infection (2). WHO estimates that dengue hemorrhagic fever can attack potentially 2.5 billion or 2/5 of the total population of the earth, and more than 100 countries in the world (World Potential Dengue Infected / WPDI) (3, 4). Nevertheless, WHO estimates only 2% of WPDI is really exposed to dengue hemorrhagic fever (± 50 millions souls / World Dengue Infection / WDI) (3). Estimation that clearly based on the WHO criteria for diagnosis of dengue hemorrhagic fever in 1997. With that 1997 criteria, the WHO estimated that patients who were hospitalized because of dengue hemorrhagic fever were only 2% of the WDI (± 500 thousands person / World Dengue Infection Hospitalization / WDHI) (3). While the mortality rate in the world until 2009, the WHO can not estimate. Because it can only be known from the mortality reports of patients who were hospitalized. WHO says that it can be just under 1% or more than 20%, depending on how the patient is receiving treatment. Some journals say that the death of dengue patients in the world each year ranges between 21000-30000 (1, 4, 5, 6, 7, 8). The number 21000-30000 is synonymous with WDHI 5% (5% x 500,000 = 25,000). Additionally the WHO says that 70% of DHF occurred in countries considered hyperendemic dengue (1.75 billion). These countries are Indonesia, Thailand, Philippines, Malaysia, Singapore, Brunei, Myanmar, Cambodia, Vietnam, Laos, East Timor, India, Bangladesh and Pakistan. The issue is whether DHF by the WHO estimation is accurate or not? To answer that we need to discuss the weaknesses of dengue diagnostics when adhering to the WHO criteria in 1997. 1. 2-7 days presence of fever. 2. The presence of bleeding manifestations, at least when it’s done with spygmamometer torniquet test (Rumple leed test), it is positive if found petechiae> 10 the diameter of 2.8 cm at the elbow or arm folds ventral. 4. An increase in hematocrit> 20% based on a standard age, gender (Indonesia has not agreed on this standard). Or if the 20% increase in hematocrit after fluid therapy in the hospital the hematocrit fell by 20% than before given fluids. a. fever before than 2 days, although the platelet count had reached 90,000 and the test torniquet +. In fact many doctors do not examine tourniquet test because the fever hasn’t been present for 2 days. Most patients will be sent home with an unclear diagnosis. b. In patients with fever 2-7 days but platelet count has not gone down below 100,000 / mm3, or the doctor would not dared to diagnose DHF to the patient even tourniquet test is +. If that patient hospitalized and during hospitalized platelet count never drop below 100.000/mm3 even dengue serologic test is +, the doctor still would not dare to make diagnosis is DHF. The diagnosis maybe is only dengue fever (not DHF). If dengue serologic is – the diagnosis is unclear. In fact, many internists would not dare for diagnosing DHF too in the other case. Because they didn’t found hemorrhagic manifestation like tourniquet test + or the other hemorrhagic manifestation even platelet count gone down below 100.000 and dengue serologic test + (appropriate DHF criteria 1997). c. Patients with fever 2-7 days, but do not want to be hospitalized,with torniquet + , platelets 170,000 / mm3 ascertained that the diagnosis is not DHF, no matter how patients have to say that his/her platelet count typically ranges between 300,000 if he’s in good health. Torniquet test shows the fragility of the capillaries and is a very significant test for DHF has not been properly understood. Non-dengue febrile illness usually only provide tourniquet test positive, if febrile illness has lasted over 7 days or the patient suffers from DM (mikroangiopathi) or malnutrition / deficiency of vitamin C.
d. Often a doctor focuses too much on serology examination or getting too interested on weird laboratory result which often happens in examining DHF patients. In the primary book at scientific meeting of Medical Faculty University of Indonesia in 2011, In page 364-365, we can read how these mistakes had been done by internist candidate by neglecting the possibility of DHF diagnosis in young woman (25 y.o), 3 days of fever with thrombocytopenia and leucopenia only based on serology test, which is negative on the 3rd day. There wasn’t any single tourniquet test that had been seen in this patient. The high level of SGOT and SGPT (110 and 144) which is likely had caused them to neglecting DHF possibility. Weakness in understanding Dengue infection and so often the words issued by Dengue expert, that dengue infection is a self limiting disease, is the basis of all error. Dengue infection in humans can’t be told as self-limiting disease. 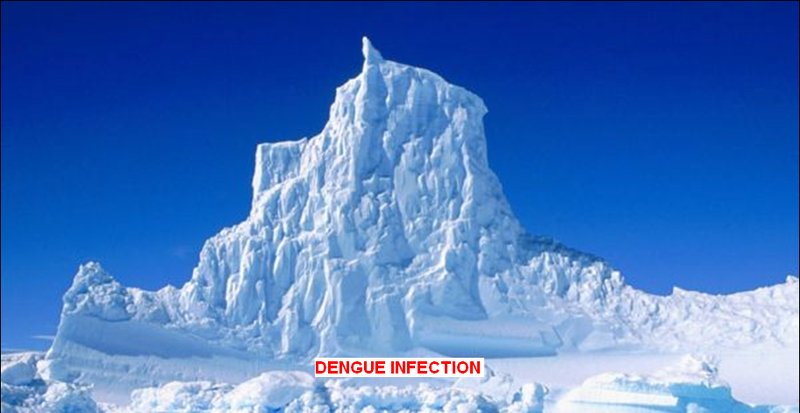 Because the assessed are only patients who are at the top of the iceberg, that a maximum of only ±10% of Dengue infected humans. Treated patients can’t be said to have self-limiting disease. Because these patients are to be given enough fluid and adequate rest while undergo treatment. Meanwhile ±90%of patients that has been infected by Dengue infection and can’t be given enough treatment we don’t know about their well being at all (no data received). e.The difficulty of establishing the diagnosis of dengue fever based on WHO 1997, lead to the diagnosis of chikungunya soaring. Though serological test, especially chikungunya virus isolation is not done, because it is difficult and expensive. As a result, patients often with fever of 2-7 days , platelets 130 thousand, torniquet test positive, but an illness of severe bone pain is diagnosed as chikungunya. Top of that, 1-2 recent years there are several educational centers that states they rarely encounter Dengue patients but instead found many chikungunya cases. With the above reasons it is clear that the diagnosis of dengue fever based on the WHO criteria in 1997 resulted in many lost cases of dengue hemorrhagic fever or undiagnosed. When the missing cases were counted all the figures WDI / WDHI should be higher. So WDI may be increased 10% from WPDI. WDHI will increase 10% from the WDI. The death rate by the percentage may remain 5% of WDHI, but with an increasing number of WDHI the number of deaths would be much larger though still 5% of WDHI. Example, calculation of the nations hyperendemic dengue. • The death rate: 5% x WDHI = 5% x 17,5 million = 875000 out of 1.75 billion people in hyperendemic dengue populated areas. Where the data is mostly comes from the hospital. How many people have died from dengue infection that is not hospitalized? WE DO NOT HAVE DATA. • The death rate: 5% x IDHI = 5% x 2.4 million = 120,000. This figure is the number of deaths for which data is mostly from the hospital and the actual number of deaths from dengue hemorrhagic fever infection is obviously much greater. With the above reasons the WHO felt the need to make a revision of the criteria for the diagnosis of dengue fever in 1997. 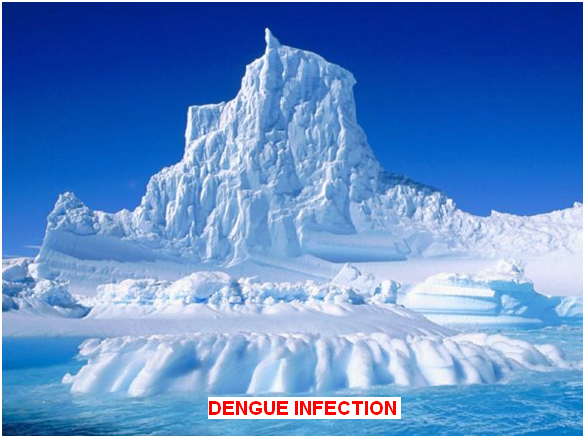 Something that must be done by the WHO, considering one can be infected with dengue virus but provides only mild clinical symptoms (the base of the iceberg), and in a very fast tempo that person can experience death (iceberg). Based on the WHO in 2009, a person suffering enough with fever of one day and have a second clinic for suspected symptoms of dengue infection. 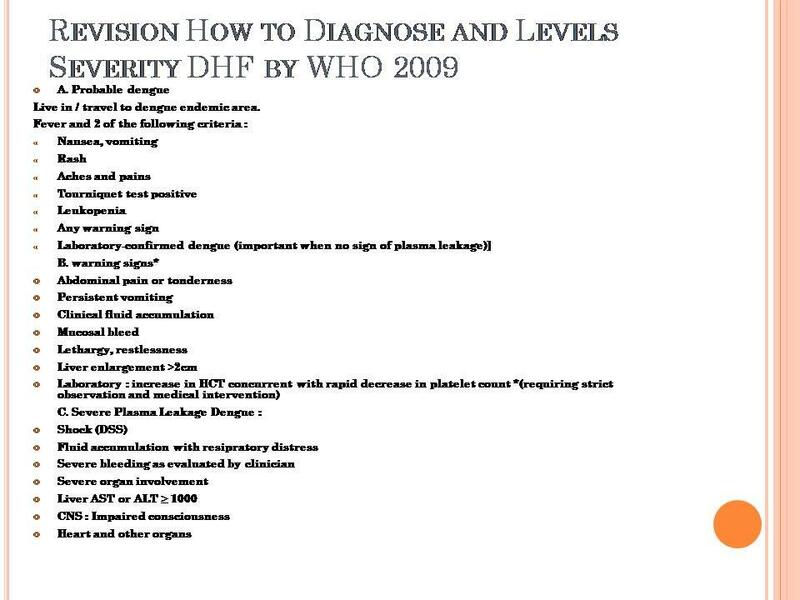 Comments on the revised WHO for dengue fever diagnosis in 2009. Meaning for probable dengue hemorrhagic in hyperendimic areas like Indonesia is considered all patients ≤ 7 days with fever that caused by the dengue virus until proven otherwise. Therefore torniquet inspection test should always be done. When torniquet test positive, as I said before it is almost sure that his/her dengue infection that causes it. But if the results are negative signs such as nausea, vomiting, abdominal pain, leukopeni, seems much too common. Because of it torniquet test must be sharpened, as well as the purpose of any warning sign as written in the 2009 WHO criteria (11). If the torniquet test result is negative, then half an hour later try again seen whether torniquet test had turned positive. If it’s still negative, try the torniquet test on the other side of the arm. If the test remain negative do the torniquet every 8 hours for 2 days of hospitalization. See the results of routine blood. • Platelets <150,000 or platelets have approached 150,000 / mm3 (eg ≤ 170.00/mm3) presence of pancytopenia, platelet count decreased significantly (≥ 50,000), diff lymphocyte count ≤ 20%, monocyte count diff ≤ 3%. Hb> 14% and a hematocrit> 42% ( Indonesian <60 years). > 15gr% hemoglobin and hematocrit> 45% (Indonesian people> 60 years), Ht / Hb> 3x. • Check lymphocyte plasma blue. LPB> 1% are positive. 3. Even in patients with no fever, we should suspect dengue infection, when the signs I mentioned above can be found. 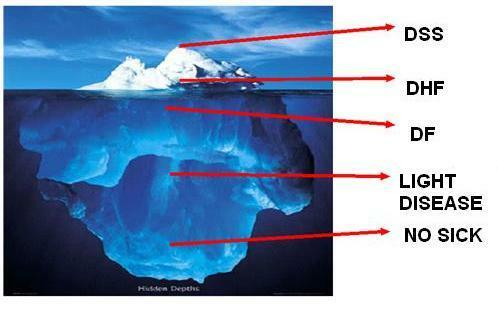 Because like the iceberg phenomenon showing a person can be without symptoms of fever, but in a very short time he would reach the the tip of the iceberg. 4. Each patient with hypovolemic shock should be considered the possibility of dengue infection. Because dengue infection may activate kinin, activation of complement C3 A C5 ​​A, all of which can provide a terrific shock syndrome without existence of bleeding or discharge (diarrhea, vomiting, sb). diarrhea for 2 days with a frequency over 10 times a day, the consistency of liquid, blood (-), mucus (-). fever 2 days day and night, nausea, vomiting (+), can still eat and drink although slightly, no other complaints. Came to the hospital on 3 March 2011 Time 22:00 pm, because of the body fever from the morning (at 09.00 am in the morning). Patients dated 27/2/11 to 28/2/11 recently treated in hospital because of dyspepsia syndrome and hypertension. So the patient was at home for only 3 days and then come to the hospital for care again. Blood pressure 100/palpable, pulse regular 100 x/menit, equal, content enough. McGuire P. The devil disease : Dengue fever. The magazine of the John Hopkins Bloomberg school of public health. Spring 2010.
WHO. Dengue hemorrhagic fever : Diagnosis, treatment, prevention and control. Second addition, Geneva : WHO, 1997. Dussart P, Labeau B, Lagathu G, Louis P, Nunes M R T, Rodrigues S G, Storck-Hermann C, Cesaire R, Morvan J, Flamand M, and Baril L. Evaluation of an enzyme immunoassay for detection of dengue virus NS1 antigen in human serum. Clinical and vaccine immunology, November 2006 ; 1185-1189. V Kumarasamy, K Chua S, Z Hassan, A Wahab A H, K Chem Y, M Mohamad, B Chua K. Evaluating the sensitivity of a commercial dengue NS1 antigen-capture ELISA for early diagnosis of acute dengue virus infection. Singapore Med J 2007 ; 48(7) : 669-673. Shu P Y and Huang J H. Current advances in dengue diagnosis. Clinical and diagnostic laboratory immunology July 2004 ; 642-650.
WHO Dengue status in south east asia region : An epidemiological perspective. WHO, 2008. ARTIKEL 23 – Vaksinasi DBD Untung Atau Rugi ??? ARTIKEL 24 – Vaccination DHF Profit Or Loss? ARTIKEL 27 – Mungkinkah Infeksi Virus Dengue Dapat Memprovokasi Terjadinya Hepatitis Autoimun Fulminant dan Sistemik Lupus Erimatosus ? ARTIKEL 28 – Can Dengue Virus Infection Provoke The Occurrence of Fulminant Autoimmune Hepatitis and Systemic Lupus Erimatosus? ARTIKEL 36 – Dengue Infection as One of The Reason of Maternity Death in Indonesia. Intermezzo – Bagaimanakah Onomatopoeia Bunyi Jantung Kita? Intermezzo-What is onomatopoeia of Our Heart beat sounds like? Artikel 46 – Apakah Diagnosa Kasus Ini Probable Dengue? Thypoid Fever? Cikungunya? Leptospirosis? Hantavirus?